le chaudron de vulcain – February 10 , 2019. EN. 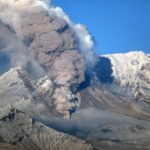 Kamchatka : Sheveluch , Colombia : Nevado del Ruiz , Indonesia : Merapi , Chili : Chaiten . February 10 , 2019. EN. Kamchatka : Sheveluch , Colombia : Nevado del Ruiz , Indonesia : Merapi , Chili : Chaiten . Home / blog georges Vitton / February 10 , 2019. EN. Kamchatka : Sheveluch , Colombia : Nevado del Ruiz , Indonesia : Merapi , Chili : Chaiten . Explosive-extrusive eruption of the volcano continues. Ash explosions up to 32,800-49,200 ft (10-15 km) a.s.l. could occur at any time. Ongoing activity could affect international and low-flying aircraft. A growth of the lava dome continues (a viscous lava blocks extrude out on the northern part of it), a strong fumarolic activity and an incandescence of the dome blocks and hot avalanches accompanies this process. According to video and satellite data, continuously all week, a strong gas-steam plume with some amount of ash on the height 4.0-5.0 km a.s.l. drifted for about 105 km to the eastern and western directions from the volcano. The thermal anomaly over the volcano was registering all week. Photo : Yu Demyanchuck / Volkstat ru. The level of activity continues at the level: activity level Yellow or (III): Modifications of the behavior of the volcanic activity. 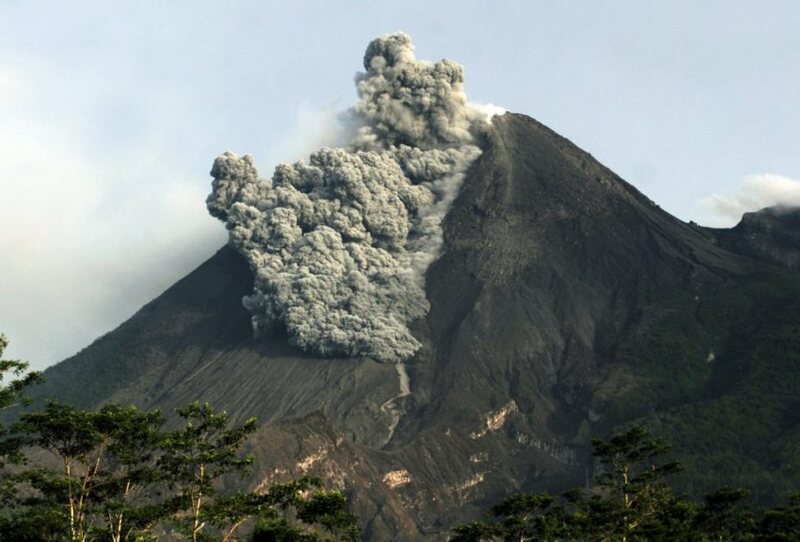 The Nevado del Ruiz volcano over the past week continued to show instability in its behavior. Registered seismicity was mainly associated with fluid dynamics within volcanic canals. The presence of volcanic tremors is highlighted, both in pulses and continuously, with low energy levels. The earthquakes occurred mainly in the crater Arenas and its surroundings. In addition, volcano-tectonic activity continued to be recorded, which is associated with the fracturing of the rock around the volcano. The earthquakes were located mainly in the Arenas crater, south, southeast and north-east of the crater, at depths between 0.6 and 7.0 km. The maximum magnitude recorded during the week was 0.9 ML (local magnitude), corresponding to an earthquake on January 31 at 6:37 am (local time), at a depth of 1.8 km, in the crater Arenas . 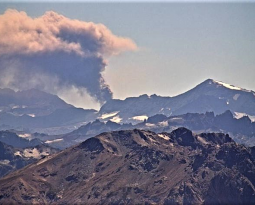 Volcanic deformation measured from electronic inclinometers has recorded slight changes in recent days, possibly associated with minor inflationary processes on the Nevado del Ruiz volcano. The volcano continues to emit water vapor and gases into the atmosphere, among which is the sulfur dioxide (SO2), as evidenced by the values obtained by the SCANDOAS stations installed in the region of the volcano. satellite image analysis. During the week, the NASA FIRMS and MIROVA portals reported several low-energy thermal anomalies. 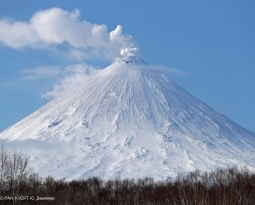 The column of gas and steam reached a maximum height of 2,000 m, measured at the top of the volcano on January 29th. The direction of dispersion of the column was governed by the direction of the wind in the region, which prevailed towards the west and northwest of the volcano. 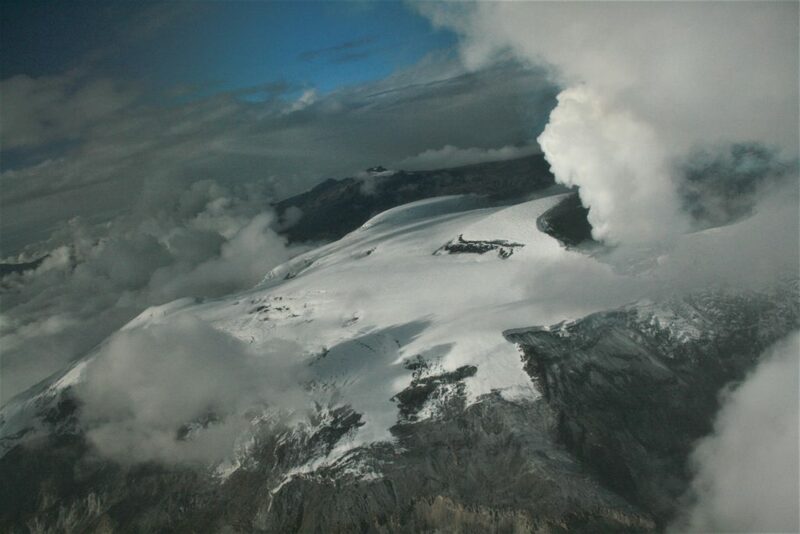 The Nevado del Ruiz volcano continues at the level of yellow activity. Photo : Fuerza Aérea Colombiana. The weather is sunny in the morning and in the evening and the foggy afternoon. The smoke observed from the crater is white, thick, with low gas pressure. A maximum height of 150 m is observed from the Mount Merapi observation post in Kaliurang on 3 February 2019. The morphological analysis based on photographs of the Southeast sector revealed no change. Appendix 1.a presents the peak morphological analysis performed by the Kalitengah Lor camera station. The volume of the lava dome was relatively fixed compared to the previous week’s data. Most of the lava extrusion that occurs immediately falls in the upper part of the Kali Gendol. Annex 1.b shows the lava dome of the Puncak camera station. It was observed that a hot avalanche occurred on February 7, 2019 towards Kali Gendol. Hot cloud avalanches occurred at 1828, 2000 m slip, 70 mm amplitude, and 215 seconds duration. This week, the seismicity of Mount Merapi recorded: 1 hot avalanche (PF), 25 emission earthquakes (DG), 2 earthquake earthquakes (VTB), 4 multiple phase earthquakes ( MP), 377 low frequency earthquakes (LF) and 7 tectonic earthquakes (TT). The intensity of seismicity this week is higher than the week before. The deformation of G. Merapi that was monitored by EDM and GPS this week did not show any significant change. The DOAS (Differential Optical Absorption Spectroscopy) measurement up to January 12, 2019, gave an average value of maximum SO2 emissions from Mount Merapi at 89.57 tonnes / day, still within normal limits. This week, it was raining at the Mount Merapi observation post, with a 50 mm / hour rainfall intensity for 30 minutes at Babadan Station on February 1, 2019. No cases of lahar or flow increase in rivers downstream of G. Merapi has been reported. Photos : BPPTKG, Yohannes Tyas Galih Jati / Volcanodiscovery. During the evaluated period, a total of 14 seismic events were recorded, of which 9 were classified as volcano-tectonic (VT), associated with rock fracturing processes. The event of greatest energy had a local magnitude (ML) equal to M 1.1, and was located 2.5 km south-southwest of the center of the dome, at a depth of 4.5 km. Also, 3 long period type (LP) earthquakes were recorded, in relation to fluid dynamics within the volcanic edifice, the largest having a reduced displacement value (DRc) equal to 4.1 cm2. Finally, two Hybrid (HB) type seismic events were recorded, in relation to a complex mechanism (fracturing process of rigid materials and fluid dynamics within the volcanic edifice) with a reduced displacement value ( DRc) equal to 9.1 cm 2. The images provided by the IP cameras installed around the volcano, when the weather conditions allowed it, showed a superficial activity of a maximum height of 500m and an incandescence during the night. 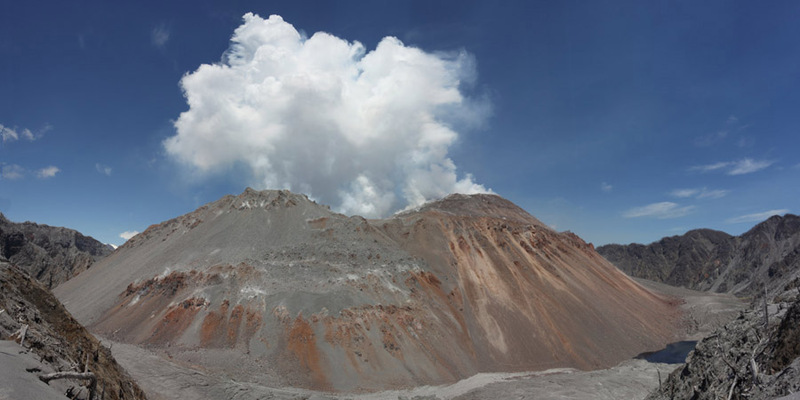 No sulfur dioxide (S02) emissions have been reported in the area near the volcanic building, according to data published by the Ozone Observatory Sulfur Dioxide Group (http: // mon2.gsfc.nasa.gov/). ) and the National Information and Satellite Data Service on the Environment (NESDIS) (http://satepsanoine.nesdis.noaa.gov). 9 thermal warnings were reported in the area associated with the volcanic complex during the period, with a maximum PVR of 3 MW, considered low, according to the data processed by the mean infra-red observation. Volcanic Activity (MIROVA) (http://www.mirovaweb.it/) and Temporal Thermal Monitoring of Global Hot Spots (MODVOLC) (http://modis.higp.hawaii.edu/). Seismicity remains at levels considered low and suggests a relative stability of the volcanic system. 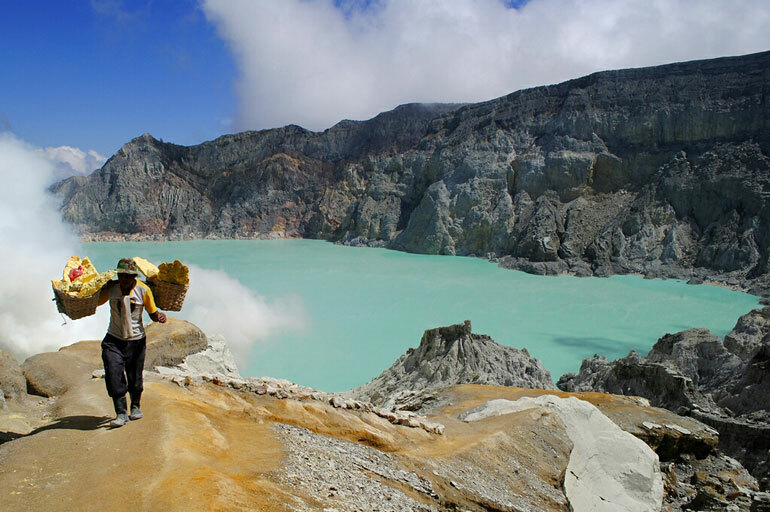 GREEN LEVEL: Changes in the behavior of volcanic activity – Probable time for an eruption: WEEKS / MONTH. 10 Fevrier 2019. FR. 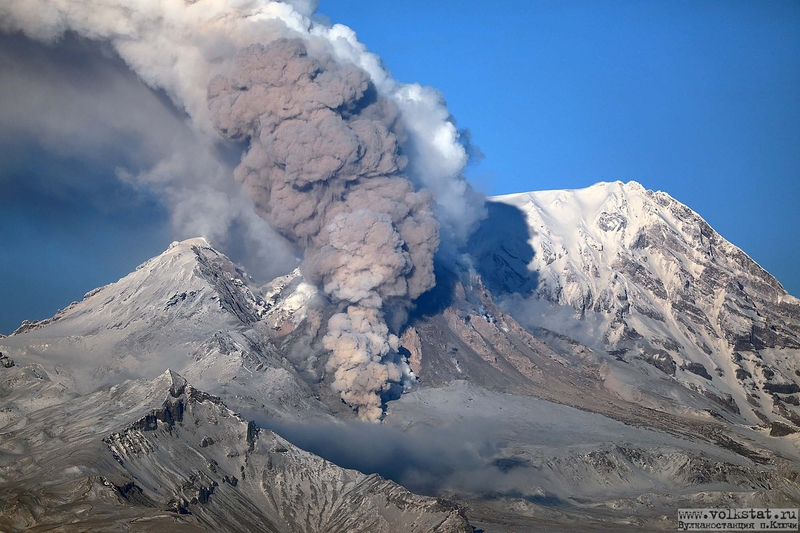 Kamchatka : Sheveluch , Colombie : Nevado del Ruiz , Indonesie : Merapi , Chili : Chaiten . 11 Fevrier 2019. FR . 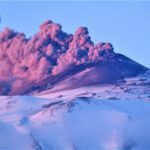 Italie / Sicile : Etna , Chili : Copahue , Indonésie : Dukono , Mexique : Popocatepetl .